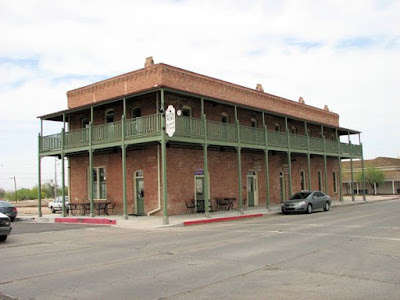 The Silver King Hotel in Florence, Arizona was built in 1876 by William Long, who was a partner in the Silver King Mine. The actual mine was 35 miles away, near the current town of Globe, Arizona. Florence was the nearest well-established town to the mine at that time, so the mine headquarters were set up in Florence. The lure of silver created an influx of wealth-seekers coming to town hoping to make their fortune. Mr. Long decided to diversify beyond mining and built both the hotel and a dry-goods store in Florence. 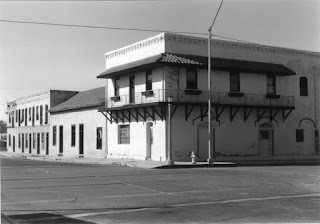 The original Silver King Hotel building was an L-shaped adobe structure, with the main building fronting on Main Street and a side wing fronting along 6th Street. In the photo above Main street is the street on the long side of the hotel to the right, 6th Street is the side street to the left. The original hotel building had a gable roof, in contrast to the flat roofs common for the area at that time. 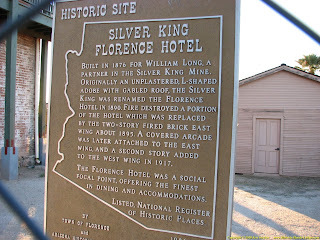 After 14 years operating as the Silver King, the hotel was renamed the Florence Hotel in 1890. In 1893 the hotel burned and the portion fronting on Main Street was torn down. Around 1895 a new 2-story fired-clay red-brick structure was built on the Main Street side, which remains today. This new brick building did not have a balcony as it does today. The pictures above and below are of the restored brick section of the Silver King Hotel. Sometime around 1910 a wood arcade/balcony was built around the exterior of the red-brick main building. The balcony provided a cool place for guests to sit or even sleep on hot evenings. By 1914 a roof had been added above the second floor balcony, which allowed the balcony area to be used as true sleeping rooms on hot summer nights. Canvas partitions could be rolled down to provide some privacy for these outdoor "rooms" on the balcony. By this time the Florence Hotel had become the social focus of Florence, with the finest dining and most modern guest rooms. It also housed the stagecoach office. 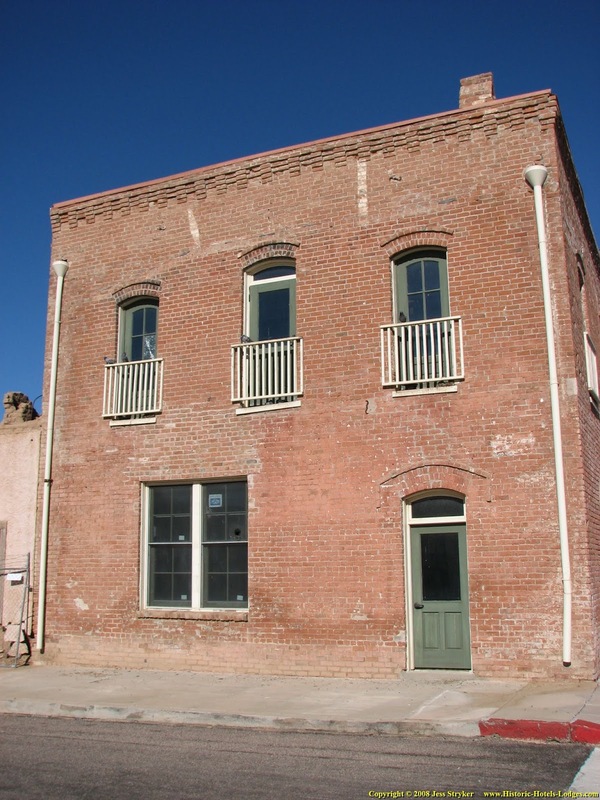 Demand for rooms was high, and in 1917 a second floor was added to the rear adobe wing to provide more guest rooms. Over the years the Town of Florence's fortunes waned. Other cities came to prominence and new development bypassed the community. The Florence Hotel similarly fell into a state of decline, or at best, suspended animation. Despite rough times, the restaurant and bar at the Florence Hotel managed to survive well into the 1970's. Newer lodging was built in town and the rooms at the Florence Hotel shifted to low-rent residential uses rather than serving travelers. Many changes were made to the buildings, windows were filled in, rooms were enlarged, bathrooms were added. Various small fires destroyed parts of the hotel and they were rebuilt. The wood balconies were removed and smaller steel balconies for fire escape purposes were added. The restaurant and bar closed for good in 1977 and the main red-brick building sat vacant for many years. Some of the back units in the adobe section still served as low-rent housing. 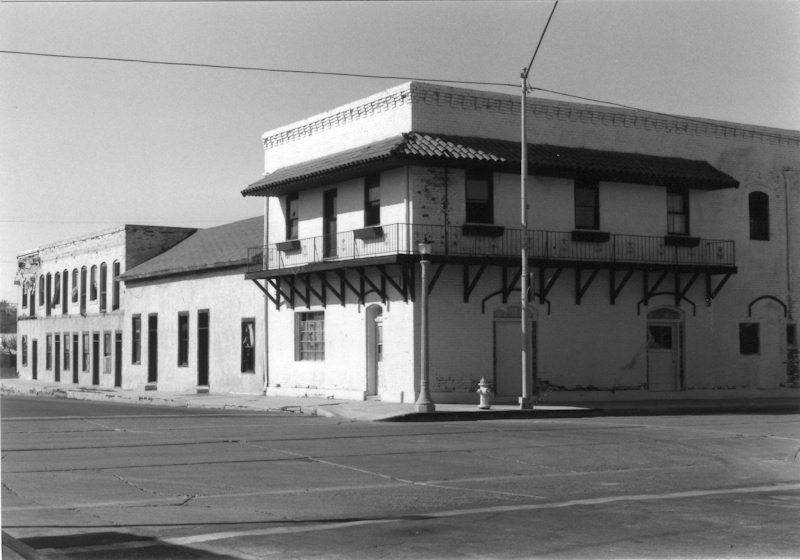 In 1995 the building caught fire, the roof was burned off, and little was left but the adobe and brick walls. The buildings were condemned and fenced. Without a roof on the adobe section the rain quickly dissolved the adobe walls of the side and back wings, and large portions of them fell down. As of late 2009, the rear adobe section of the hotel has been torn down. A new wood porch has been installed on the front brick section and the interior has been restored for adaptive reuse. It no longer serves as a hotel. There are a number of businesses located in the restored brick portion of the building, mostly tourist oriented. It's been a long hard road back, but once again the old Silver King really looks good. The Silver King Hotel in 1991 before the two rear wings burned and were lost. This photo was taken by my father, Robert Stryker. 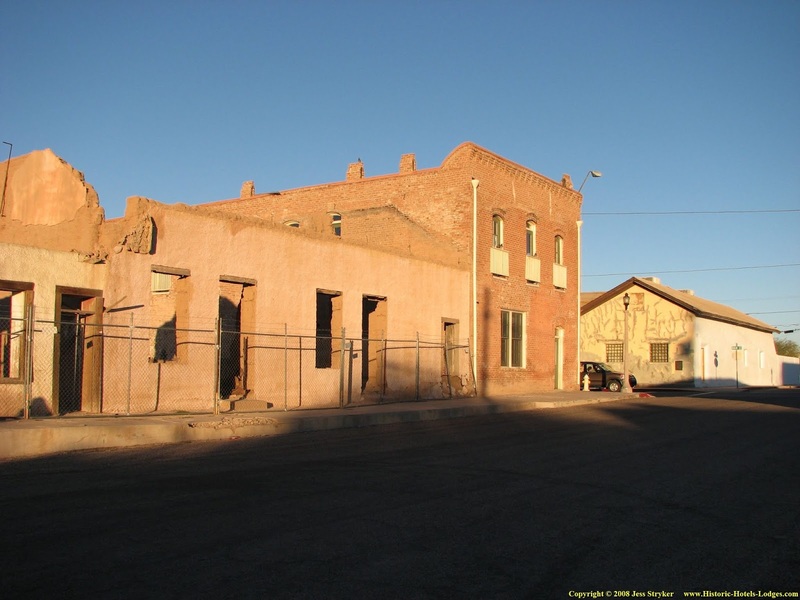 The section in the middle with the gable roof is part of the original 1876 adobe hotel. The two story section closest to the camera with the balconies is the later brick main hotel built around 1895 after the front half of the original hotel burned down. It is all that remains today. The 2-story rear wing to the far left was the most recent addition, built sometime in the early 1900's, it is also adobe. Here is the Silver King Hotel in December of 2007, as viewed from the far corner of Main Street and 6th Street. 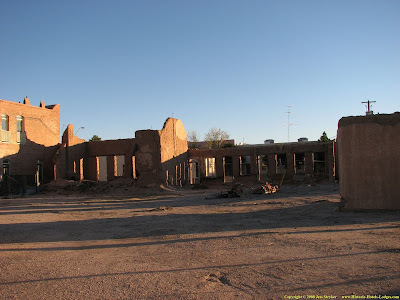 At the time the photo was taken the ruins of the walls of the adobe sections of the hotel were still standing. This photo is from December of 2007 after phase 1 of the brick building restoration, but prior to the start of the phase 2. You're looking at the 6th Street (south) side of the red-brick main hotel building. The white railings on the second floor doors were temporary, added for safety, since those are operable doors. The door and window locations were restored to the original locations shown in early photos taken within a few years of construction of the red-brick section. If you look at the more recent photos at the top of this page you will see that the white railings were removed and balconies were added to the brick main hotel in the 2nd phase of restoration. The second floor rooms in the red-brick section likely had a single window each, and adjacent rooms shared a chimney. Using this photo and photos of the Main Street frontage indicates the red-brick main hotel building originally had 15 upstairs guest rooms. The small chimney size indicates that the red-brick section likely had coal burning fireplaces in the rooms for heat. Coal-burning fireplaces allowed for the use of smaller chimneys than wood burning fireplaces. Also the lack of a quality wood source here in the Arizona desert would support the conclusion that coal would be used. 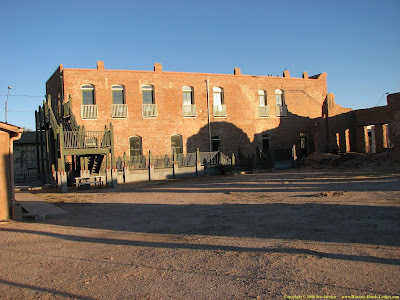 This is a photo of the courtyard area of the Silver King Hotel when the ruins of the old adobe side and rear wing walls were still standing (2007.) In this photo you can clearly see the various sections of the hotel. At the far left you can see a portion of the red-brick section built in 1895. Left center, with the tallest adobe walls, is the remains of the original hotel building dating from 1876. This original adobe hotel was single story with high ceilings and had a sloped gable roof, you can partially make out the roof line from what remains of the adobe walls. On the right is the newest section, also built with adobe, probably dating from around 1910-1917. This is a panoramic shot of the old hotel wall ruins on the 6th street frontage in December of 2007. Compare this photo with the black and white photo my father took in 1991 when the rear section was still standing. Another photo showing the south side of the original section of the hotel. 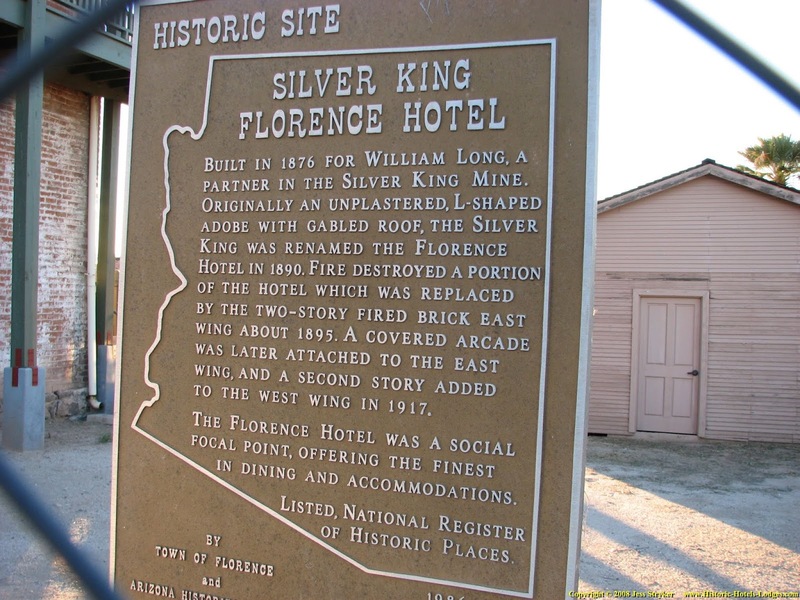 The Silver King / Florence Hotel National Register of Historic Places marker. Ghosts? 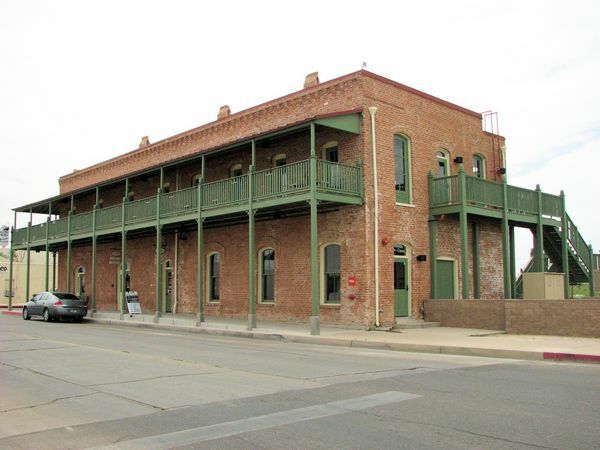 There are reports of ghosts at the Silver King Hotel, mostly in the form of disembodied voices heard in the building. 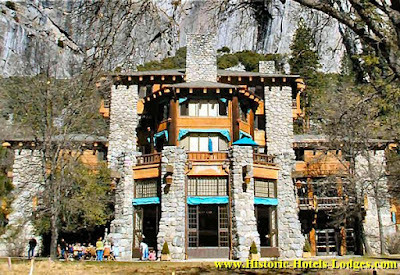 Typically ghost reports are tied to famous former visitors to a hotel, or tragic events at the facility in the past. However, I can't find any reports of names or any details for these ghosts.